Duke Realty partnered with Roosevelt University to offer a scholarship and mentorship program to provide women and minorites the opportunity to find success in the real estate industry. The DREAM Fund offers four Roosevelt University students $5,000 in annual scholarships for two years toward their Master of Business Administration in Real Estate or Master of Science in Real Estate degrees. 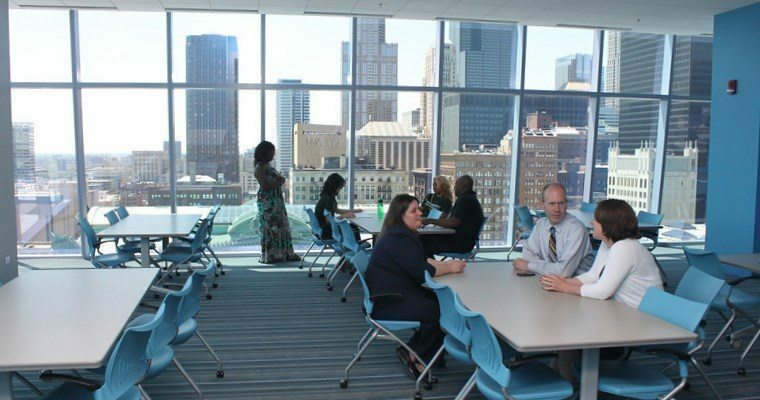 The scholarship program also includes a mentorship program with Duke Realty executives and first chance at open positions at any of the company's offices throughout the nation. This September, a few lucky Roosevelt University students will get the opportunity to make headway in the real estate industry thanks to a partnership between the school and Duke Realty Corp., a commercial real estate company. The program is aimed at minorities and women attending the Chicago-based school. Four graduate students at the University’s Marshall Bennett Institute of Real Estate will be honored with scholarships and work alongside Duke Realty’s professionals. Called the Duke Realty Fund for Education and Advancement of Minorities and Women in Real Estate — The DREAM Fund — the program is Duke Realty’s way of providing opportunities for success and recruiting talent. Students who receive the scholarships will get $5,000 annually for two years towards a Master of Business Administration in Real Estate or Master of Science in Real Estate degree. Additionally, the scholarship comes with a mentorship program with Ryan O’Leary, the senior vice president of Illinois, Minnesota and Missouri regions for Duke Realty, as well as other executives at the company. To apply, students need to fill out a two-page application and statement of interest documenting why they would be a good fit for the program. Those who progress through the first portion of application process will interview with Duke Realty and Jon B. DeVries, director of the Marshall Bennett Institute of Real Estate at Roosevelt University. DeVries says Duke Realty is offering paid internships to students who qualify, and the company is also providing first-place notification and consideration for job openings at any of the company’s nationwide offices to graduating students. Although this partnership is the first program of its type, Duke Realty isn’t a stranger to programs aimed at helping build diversity. The real estate company has a similar internal program. Is it a good time to sell in the Chicago suburbs?